We recently received the postcard above and it caught our attention right away. It had a scratch off game right on the front with the promise of a prize! 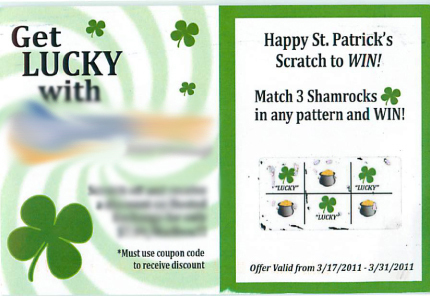 The simple instructions indicated to call and provide the coupon code revealed under the scratch off area to claim the prize. 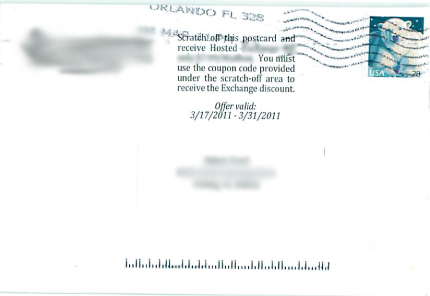 However there was no coupon code to be found, in addition there was no phone number, no website address or any method to contact them at all. This was a fun and engaging marketing idea that obviously didn’t come cheap, however, forgetting these simple elements removed any opportunity for a return on investment. This is a fairly extreme example, but we see very similar mistakes far too often, so we thought we would take this opportunity to help you avoid some of these same pitfalls. Having a plan is more than just the idea for the piece. A plan includes what you want to communicate and what action you want the viewer to take. Before you start anything else, get a plan in place. How will you attract customers? What will you say to get them to pick up the phone, visit your website, or come to your store? Make sure you clearly say what it is you want people to do and give them the tools they need to do so. It seems simple, but people often overlook this essential step. Make sure all information is spelled correctly, phone numbers are right and you are pointing people to the correct website address. Far too often the reason for mistakes can be that the person putting the marketing piece together gets too involved in what it should look like and do, missing the bigger picture of whether or not it’s actually effective. Having someone not involved in any way see the piece can be a good gauge of whether or not you need to make changes. Show your marketing piece to a person in a different department at your company, or even your spouse. If he/she can understand the message and knows what to do after reading it, then it’s pretty safe to say you have a good marketing piece! By just following a few of these tips, you can make sure your marketing piece isn’t a waste of time and money. Do you have any tips you’d like to share to make marketing pieces more effective?